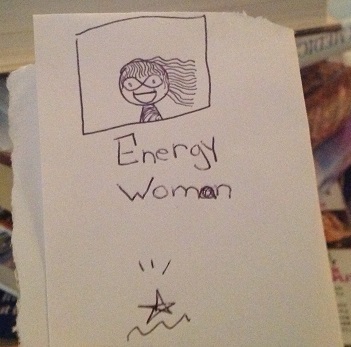 Home » Blog at Mom On A Spiritual Journey » Energy Psychology and Energy Work » I am Sarah, Energy Woman! If you were a SuperHero…what would you look like and what are your special powers? If you were a SuperHero, who/what/how would you be? I was busy typing away yesterday when my youngest daughter asked me this question. “Why do you want to know?” I asked her. “Oh, I’m writing security slips for my birthday sleepover, you can only come in if you slide your identity under the door”. Children – always getting us adults out of our boxes by thinking differently! What would your mask be like? What would your hair be like? What sort of cape would you wear? “It would be like Harry Potter’s cape, invisible sometimes and active with rainbow/chakra colors at other times”. That was enough for her to make the drawing. A pretty good likeness! What else would I have asked? What symbol would I have on my chest? (In my case, a heart). What powers would I have? (The ability to see stuck energy and help people shift it, the ability to help people with their energetic wounds, the ability to fly cause it’s fun and energetic!). What tools would I carry? Unlimited love potion number 99, to cover love of all types (not just romantic) when people need a boost. A negative energy detector and clearer. A vibrational viewer so people could learn to see their own personal energy and discover that it’s real! Love to hear your answers here or on my Facebook Page. Signing off in energetic power!